Karen saw her first hockey game at the Wagon Wheel in Rockford. From Wausau, Wisconsin, her dad played pond hockey growing up, often saying that the team colors were black and blue. When the family moved to Downers Grove, a pond at the end of the block afforded her mom a place a place to practice her figure skating while Karen, her brother and her sister were in school. Winter trips to Wausau included ice time and hot chocolate. Karen got a BS in Recreation and Park Administration at WIU despite flunking out her freshman year (while having a very good time). In a tough job market, she became a part time adult sports supervisor and “commissioner” of the men’s and women’s 12” and 16” softball leagues in Downers Grove, and subsequently, Villa Park. Her reputation for fairness and smooth running of leagues brought her opportunities to run regional and national events. One team captain commented that he liked to watch new teams figure out that she was in charge. 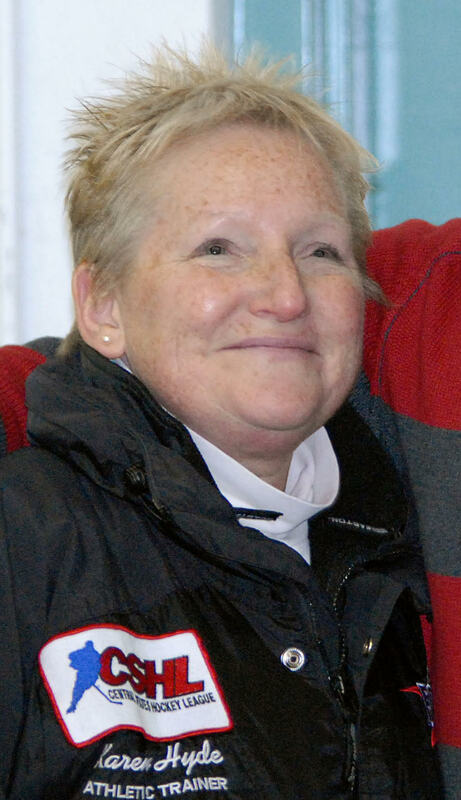 At the time, Karen was a bit of an oddity in the hockey community both as a female and an athletic trainer. Some assumed she was someone’s mom, others assumed that with her short hair, she was a boy. Kasak had her speak at coaching clinics and, with OPRF having a top 4 team and Illinois hockey being a small organization, Karen quickly became involved helping with state events. The state playoffs and Chicago Showcase were held at Franklin Park at that time. Wanting to know more about how hockey worked off the ice, she attended state meetings with the blessings of Jim Carolyn, Metro West director. Norm Spiegel, Jim Smith, Lou Morgan, Jim McGlynn and Steve Pinkstaff were all gracious in answering her questions. Upon becoming nationally certified, Karen became the head athletic trainer at Downers Grove North High School. In addition, she provided coverage as the head trainer for the US Olympic fencing trials twice, judo nationals, and national volleyball events among others. Over time, Karen realized that while teachers had substitutes available, athletic trainers didn’t. She and a friend, Lelia Siano, decided to open a company to do just that. Almost immediately, Karen received a call from the Chicago Force junior hockey team to cover their league games. At the inaugural game, Tom Wendlandt of Robert Morris-Illinois said, “We need a trainer too” and so they had their first clients. After 5 years traveling with the Force, Chico Adrahtas became head coach at Robert Morris and Karen joined him. A club team organization, RMU had close ties with the ACHA (American Collegiate Hockey Association). When athletic trainers were needed in U.S. venues, Karen was asked to supply them and often went herself, including with the USA Hockey Men’s University team to Erzurem, Turkey. Karen herself is proud to hold a USA Hockey Level 4 coaching certification and boasts a lifetime coaching record of 2-0. Becoming educationally bored, Karen enrolled at Benedictine University in Clinical Psychology. Asked why she wanted in the program, she wrote “because most athletes are crazy” and they decided they had to meet her. She plans to combine athletic training, sport psychology and clinical psychology to offer a unique service to athletes which will enable them to see one person to resolve many issues.